EGU Blogs » GeoLog » Connecting Earth scientists and school students – Apply to take part in I’m a Geoscientist! Connecting Earth scientists and school students – Apply to take part in I’m a Geoscientist! Imagine a talent show where contestants get voted off depending on their skills in their area of choice. Then imagine that this talent show is populated by scientists with school students voting them off based on the scientist’s ability to communicate their research well. This is the basis of a recent EGU educational initiative that launched earlier in 2014, and that will return in 2015. The EGU are continuing their collaboration with Gallomanor, the UK company in charge of I’m a Scientist (Get me out of here) and I’m an Engineer (Get me out of here), to run the European-wide sister project I’m a Geoscientist. The event provides school students with the opportunity to meet and interact with real (geo)scientists! The event takes the form of an online chat forum using an innovative online platform. School students log on and post questions to the scientists taking part, querying them on everything (with moderation) from their research to their favourite music. The scientists then log on and answer those questions. Based on their answers (e.g. on how well they’ve explained a particular piece of science), students get to vote out scientists until there is one left – the best scientific communicator – who wins €500 for a new public-engagement project of their choice. The primary objective of the event is to change students’ attitudes to the geosciences and make them feel it’s something they can relate to and discuss in a rapidly changing world. Students have fun, but also get beyond stereotypes, learn about how science relates to real life, develop their thinking and discussion skills and make connections with real scientists. Giving students some real power (deciding where the prize money goes) also makes the event more real for them. The student who interacts the most with scientists and asks the most insightful questions will also win a €20 gift voucher. 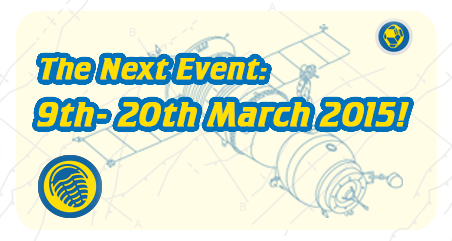 The next I’m a Geoscientist event is taking place on 9–20 March 2015. If you’d like to apply as a teacher (giving your classes the opportunity to interact with geoscientists) or as a researcher, see the details below. The deadline for all applications is 26 January 2015, and GIFT teachers and EGU members are eligible to apply. To apply to take part in the event, go to http://imageoscientist.eu/teachers/ and fill in the simple online form for teachers. Applications are open to all teachers who have taken part in a GIFT event (at any time). Successful teachers will be notified shortly after the deadline for applications, and the event will take place over two weeks on 9–20 March 2015. You will need to use some class time before the event to prepare your students, but we have flexible lesson plans already prepared to help you keep the class time used to a minimum. To take part you need to be able to devote at least 2 hours (it doesn’t matter when, and the maximum you will need is 5 hours) for those two weeks to ready your students for interacting with the scientists and take part in some online discussion – and of course you will have to have reliable internet access. The entire event will be conducted in English, so you and your class will also need a basic understanding of and ability to write questions to scientists in English. Why not team up with your school’s English department and use the event as a language learning exercise as well? If you choose to do this, make sure that the teacher who has been involved with GIFT in the past is the one who formally registers. For scientists, this is a unique opportunity to get involved with some public engagement from the comfort of your own home or lab computer, in your own time. You can build up your skills in talking about your research to varied audiences, tick the box for public engagement in your funding proposals, gain an understanding of how the public relate to research and, importantly, help inspire the next generation about the geosciences. The potential of winning the €500 prize for further public engagement is also attractive. A public engagement activity could involve: buying equipment to allow a research oceanography vessel to communicate with school students during expeditions, funding an open day for communities living in a disaster area to find out about natural hazards research and get advice, giving the money to a school in Uganda to pay for science kits and a projector to watch science films on or buying a quadcopter to film inside the rim of a volcano and help school children understand their local natural environment. To find out more about the experience of participating as a scientist read the interview with 2014 winner Anna Rabitti. To apply to take part in the event go to http://imageoscientist.eu/geoscientists/ and fill in the simple online form for scientists. Applications are open to all EGU members (if you are not a member you can register on the EGU website) from across Europe. Once applications close, we will ask the registered school classes to judge the scientist applications and chose the final 5 scientists who will get to take part in the final event. Successful scientists will be notified a couple of weeks after the deadline for applications. To take part you need to be able to devote around an hour a day (it doesn’t matter when, but if you can devote more time that is always better) for those two weeks to answer the questions posed by the students – and of course you will have to have reliable internet access. The entire event will be conducted in English, so you will also need to be able to confidently understand and communicate in English. If you have any other questions about the event, please contact Bárbara Ferreira at EGU (media@egu.eu, +49-89-2180-6703) or Gallomanor’s Angela Manasor (angela@gallomanor.com, and +44-1225-326892). Communicate your Science Video Competition finalists 2017: time to get voting!